When people consider the connections between drugs and violence, what typically comes to mind are illegal drugs like crack cocaine. However, certain medications — most notably, some antidepressants like Prozac — have also been linked to increase risk for violent, even homicidal behavior. 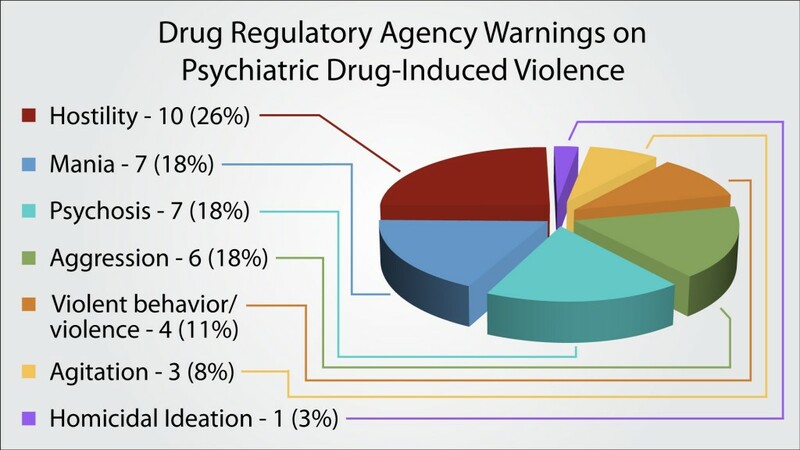 Please note that this does not necessarily mean that these drugs cause violent behavior. For example, in the case of opioid pain medications like Oxycontin, people with a prior history of violent behavior may seek drugs in order to sustain an addiction, which they support via predatory crime. In the case of antipsychotics, the drugs may be given in an attempt to reduce violence by people suffering from schizophrenia and other psychotic disorders — so the drugs here might not be causing violence, but could be linked with it because they’re used to try to stop it. 10. Desvenlafaxine (Pristiq) An antidepressant which affects both serotonin and noradrenaline, this drug is 7.9 times more likely to be associated with violence than other drugs. 7. Triazolam (Halcion) A benzodiazepine which can be addictive, used to treat insomnia. Halcion is 8.7 times more likely to be linked with violence than other drugs, according to the study. 6) Atomoxetine (Strattera) Used to treat attention-deficit hyperactivity disorder (ADHD), Strattera affects the neurotransmitter noradrenaline and is 9 times more likely to be linked with violence compared to the average medication. 5) Mefoquine (Lariam) A treatment for malaria, Lariam has long been linked with reports of bizarre behavior. It is 9.5 times more likely to be linked with violence than other drugs. 4) Amphetamines: (Various) Amphetamines are used to treat ADHD and affect the brain’s dopamine and noradrenaline systems. 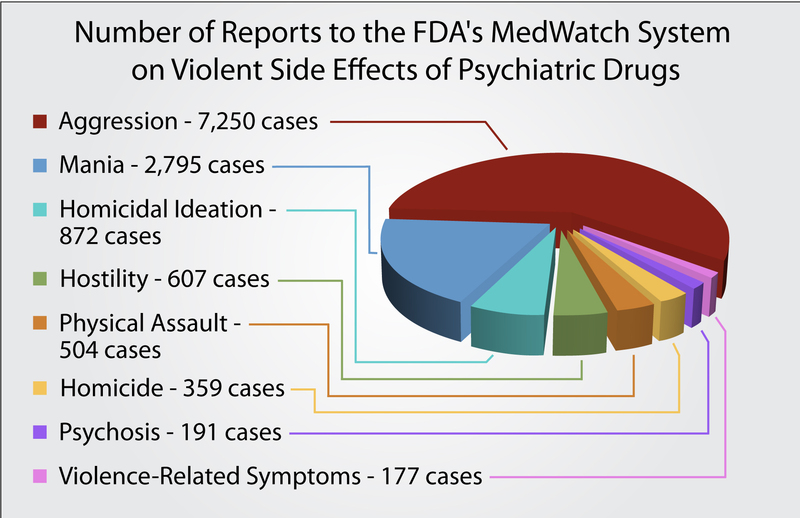 They are 9.6 times more likely to be linked to violence, compared to other drugs. 2) Fluoxetine (Prozac) The first well-known SSRI antidepressant, Prozac is 10.9 times more likely to be linked with violence in comparison with other medications. 1) Varenicline (Chantix) The anti-smoking medication Chantix affects the nicotinic acetylcholine receptor, which helps reduce craving for smoking. Unfortunately, it’s 18 times more likely to be linked with violence compared to other drugs — by comparison, that number for Xyban is 3.9 and just 1.9 for nicotine replacement. Because Chantix is slightly superior in terms of quit rates in comparison to other drugs, it shouldn’t necessarily be ruled out as an option for those trying to quit, however. Previous PostIn my opinion something finally being done: Sen. Grassley going after doctors who feed prescription drug addiction across America, and we have no doubt from our experience that Dr. Cathal P Grant MD, Bedford, Texas will be in this listNext PostIn my opinion: When it comes to Anti-depressants, it appears profit, not benefits, outweigh the risks and Dr. Cathal P Grant MD, Bedford, Texas practice is for nothing but profit his profit , he spends only 2 to 5 minutes with each patient so he can make the most profit by seeing the maxium number of patients each day and it is the patients who gets hooked on these drug in his practice when they do not need these drug at all.